For our first blog, we wanted to tell you about how harvesting rainwater is a great way to reduce your carbon footprint. And it’s not just for homes -- businesses can harvest rainwater too! 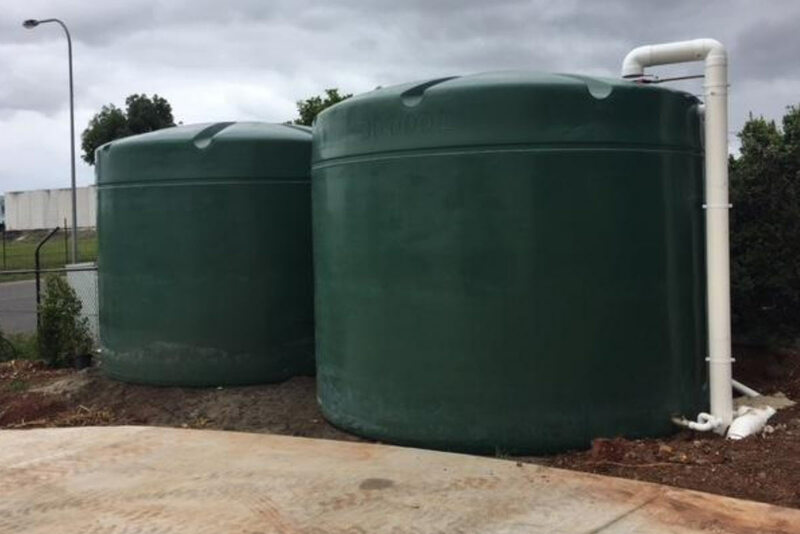 (Right inset) Our Yatala depot can store up to 60,000L of collected rainwater. Harvesting rainwater helps prevent flooding and takes pressure off our storm water drain systems during heavy rainfall. Heavy rainfall can wash away garden beds and soil, killing, rather than feeding, plant life. Plants benefit from water, of course, but too much at once can be dangerous. By capturing rainwater, we are collecting excess water to be used later on our gardens during drier spells. By collecting rainwater to wash our fleet, we are cutting down on waste. Had we not harvested the water, it would have washed away and back out to sea. Instead, our depots can collect and reuse 20,000+ litres of water (our Yatala office houses two 30,000L tanks). Without rainwater tanks, we would have to use water from the mains to clean our tanks and our trucks. Instead, we can help conserve Australia’s water supplies for the homes and businesses that need it. Collected rainwater is clean and environmentally friendly. Over time, by reducing flood and run-off waters, collecting rainwater can reduce against soil erosion and the amount of pollution entering our waterways. Cutting down our reliance on the main water supply also means we are also cutting down on our water bills. So not only is collecting rainwater a sustainable, environmentally-beneficial practice, it makes financial sense too! We wash our mobile tanks and trucks out regularly using environmentally-friendly, industry-grade cleaners. Whether you are a cooking oil supply depot, a restaurant, cafe or home, it is important to dispose of your cooking oil properly. When we wash out our tanks and trucks, we make sure our cooking oils do not pollute the environment or clog our drains. Our special washing bays collect the used water into underground tanks. We then separate the oil from the water before disposing of each. (Right inset) At Cookers’ WA depot, our washing bays keep used oil, rainwater and sediment from polluting our waterways. We also use this water to wash our warehouse daily to maintain a clean work environment. Read more about what happens to our used oil here, and our biodiesel fleet here, and join us next month for another post about Cookers Oil and our sustainability practices.